Play is an amusing interaction with people, animals, or things. Play may involve pretend or imaginary interpersonal and intrapersonal interactions or interplay. The rites of play are evident throughout nature and are perceived in people and animals, particularly in the cognitive development and socialization of children. Play often involves props, animals, or toys in the contexts of learning and recreation. Some play has clearly defined goals, and when structured with rules is entitled a game. Other forms of play exhibit neither goals nor rules and are considered to be "unstructured." Johan Huizinga gave an extensive analysis of play in his Homo Ludens and explained how diverse human cultural activities, from religious rituals to arts and sciences, emerged out of play or at least had the element of play at their basis. He defined the human being as "Homo ludens" (man the player) as opposed to "Homo sapience" (man the wise) to express the essential role of play in human existence. Play is associated with other key components of human existence such as freedom, joy, happiness, and Flow (psychology). As a theoretical concept, play is challenging to define. Rather than collapsing all views of play into a singular definition, play may be best envisioned as descriptive of a range of activities that may be ascribed to humans and non-humans. In general discourse, people use the word "play" as a contrast to other parts of their lives: sleep, eating, washing, work, rituals, etc. Different types of specialists may also use the word "play" in different ways. Play therapists evoke the expansive definition of the term in Play Therapy and Sandbox Play. Play is cast in the modal of Sacred Play within Transpersonal Psychology. The seminal text in play studies is Homo Ludens by Johan Huizinga. This work popularized the notion of the Magic Circle as a conceptual space in which play occurs. That is, the state in which the various actions in play have meaning e.g. kicking (and only kicking) a ball in one direction or another, using physical force to impede another player (in a way which might be illegal outside the context of the game). Another classic in play theory is Man, Play and Games by Roger Caillois. This work extends and in large parts disputes the theories put forward by Huizinga. A notable contemporary play theorist is Jesper Juul who works on both pure play theory and the application of this theory to Computer game studies. The theory of play and its relationship with rules and game design is also extensively discussed by Katie Salen and Eric Zimmerman in their book, Rules of Play: Game Design Fundamentals. In computer games the word gameplay is often used to describe the concept of play. Homo Ludens, or "Man the Player," is a book written in 1938 by Dutch historian, cultural theorist and professor Johan Huizinga. It discusses the importance of the play element of culture and society. Huizinga makes it clear in the forward of his book that he means the play element of culture, and not the play element in culture. However, the uncredited English translator of the Beacon Books version modified the subtitle of the book to contradict Huizinga's stated intention. The version in print, which is widely available, in English is a translation and synthesis of the original Dutch and the first English translation (done by Huizinga himself), because "a comparison of the two texts shows a number of discrepancies and a marked difference in style" (Translators Note, unnumbered page). Huizinga uses the term "Play Theory" within the book to define the conceptual space in which play occurs. Huizinga suggests that play is primary to and a necessary (though not sufficient) condition of the generation of culture. 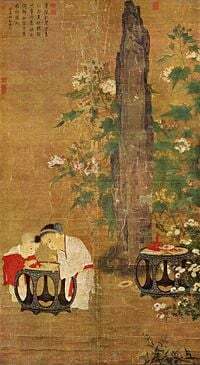 Playing Children, by Chinese Song Dynasty artist Su Hanchen, c. 1150 C.E. Many of the most prominent researchers in the field of psychology (Jean Piaget, William James, Sigmund Freud, Carl Jung, Lev Vygotsky, etc.) have viewed play as endemic to the human species. Modern research in the field of 'affective neuroscience' has uncovered important links between role playing and neurogenesis in the brain. (Panksepp, Affective Neuroscience 98). Sociologist Roger Caillois coined the phrase ilinx to describe the momentary disruption of perception that comes from forms of physical play that disorient the senses, especially balance. Perhaps the most progressive research on play has come from Stuart Brown, MD and the National Institute for Play. Stevanne Auerbach mentions the role of play therapy in treating children suffering from trauma, emotional issues, and other problems. She also emphasizes the importance of toys with high play value for child development and the role of the parent in evaluating toys and being the child's play guide. People at the National Institute for Play are creating a clinical, scientific framework for play. On their website they introduce seven patterns of play (along with reference sources for each) which indicate the huge range of types of activities and states of being which play encompasses. 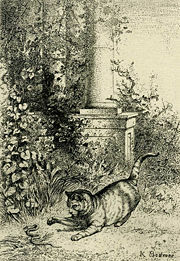 A cat playing with an adder. Play is an important part of learning in many animals, though it is generally only seen in those with highly complex nervous systems such as mammals and birds. Infants experiment with adult behaviors including fighting to learn how to survive. Predators such as lions and bears play by chasing, pouncing, pawing, wrestling, and biting, as they learn to stalk and kill prey. Prey animals such as deer and zebras play by running and leaping as they acquire speed and agility. Hoofed mammals also practice kicking their hind legs to learn warding off attacks. While mimicking adult behavior, attacking actions such as kicking and biting are not completely fulfilled so that they won't injure each other. In social animals, playing might also help to establish dominance rankings among the young to avoid conflicts as adults. Play however has traditionally been given little attention by behavioral ecologists. Edward O. Wilson wrote in Sociobiology that "No behavior has proved more ill-defined, elusive, controversial and even unfashionable than play". Though it received little attention in the early decades of æthology, there is now a considerable body of scientific literature resulting from research on the subject. Play does not have the central theoretical framework that exists in other areas of biology. Play may be divided into three general categories: Social play, locomotor play and object play. ↑ Jenkinson, Sally (2001). The Genius of Play: Celebrating the Spirit of Childhood. Melbourne: Hawthorn Press. ISBN 1-903458-04-8. ↑ Alex Hawes. Jungle Gyms: The Evolution of Animal Play. Retrieved January 3, 2008. ↑ Wilson, E. O. (1975) Sociobiology: The New Synthesis Cambridge, M.A. Harvard University Press. Huizinga, J. 1955. Homo ludens; a study of the play-element in culture. Boston, Beacon Press. This page was last modified on 7 May 2015, at 16:35.